On Oct. 8, Interior Secretary Ryan Zinke announced a 20-year ban on new hardrock mining exploration north of Yellowstone. His decision, which follows a similar recommendation from the Forest Service, puts 30,000 acres in the Paradise Valley and Gardiner Basin off-limits to new mining claims. “There are places where it is appropriate to mine and places where it is not,” said Zinke in a statement to The Hill. “Paradise Valley is one of the areas it’s not.” The withdrawal was greeted with cheers from some conservation groups and tourism interests. Others, however, criticized what they see as Zinke’s penchant for favoring protections close to home. 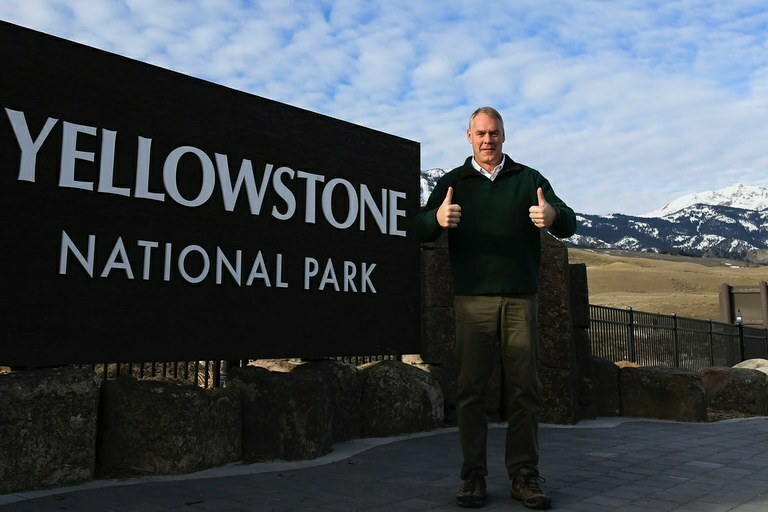 Interior Secretary Ryan Zinke on a tour of Yellowstone in March 2017. On Oct. 8, 2018, he announced new mining protections north of the park. Some national environmental groups also praised the Forest Service and Interior Department for moving to limit new mining in the area. “National Parks Conservation Association commends Agriculture Secretary Perdue and Interior Secretary Zinke for defending Yellowstone’s doorstep from industrial gold mining,” said a statement from NPCA’s President Theresa Pierno. The Trump administration, supported by the Congressional Western Caucus, attempted to reverse a similar moratorium on uranium mining near the Grand Canyon. Zinke’s Interior Department also let a mineral withdrawal on Oregon’s Chetco River expire this summer. The 20-year ban is the longest time period Zinke can sign off on without congressional approval. The Forest Service manages nearly all the land covered by Zinke’s decision; the Interior Department manages the below-ground minerals on public lands. Only Congress or the president can permanently protect the area.